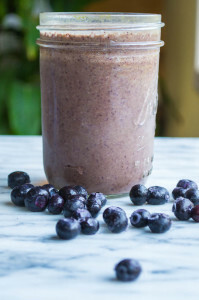 My smoothie looked a lot like this one from The Unprocessed Home where she shares her vegan version of what is essentially the same smoothie. I like her addition of hemp hearts, I’ll have to try that out. Today I worked through lunch. I really enjoy not working through lunch but it is just not always an option. Today I ate a muffin while in a meeting and drank a smoothie while I did my various desk activities. Our muffins my kids made on the weekend. We made a double batch and filled them with blueberries from the market the day before and saskatoons we had picked on our hike earlier that day.